SPACE STATION NATHAN: Nathan Hale's Hazardous Tales Unboxing! Nathan Hale's Hazardous Tales Unboxing! Hey everyone! I got a little package in the mail last week. I thought I'd do an unboxing for you. 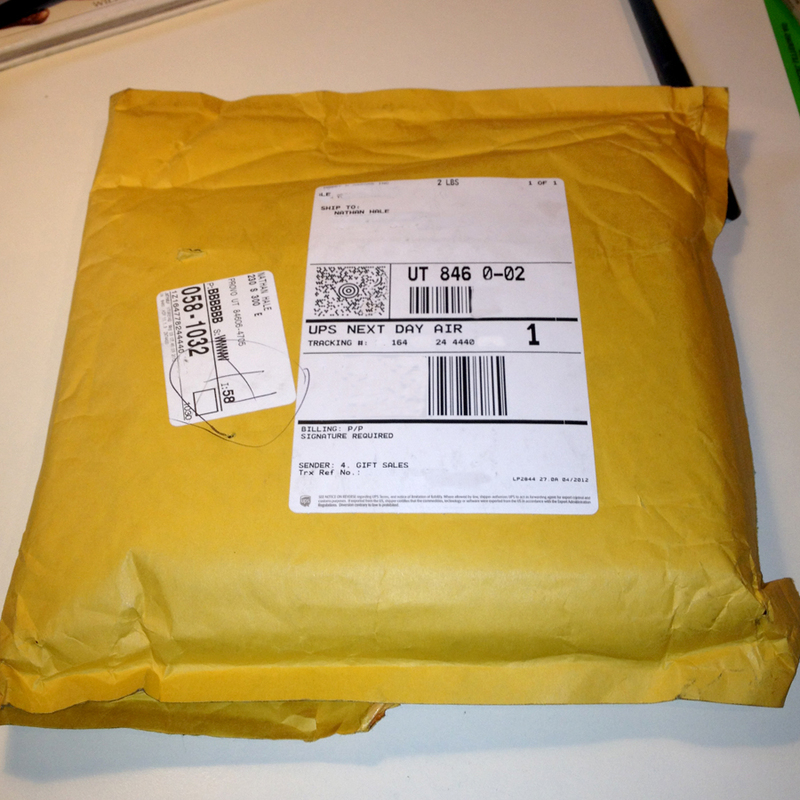 Here is the mysterious package. Puffy with promise. Hmmm, what can this be? I can make out something on the vertical slip of paper...a publisher's name, maybe? Taa-Daa! It's the hot-off-the-press first printing of my new books!!! 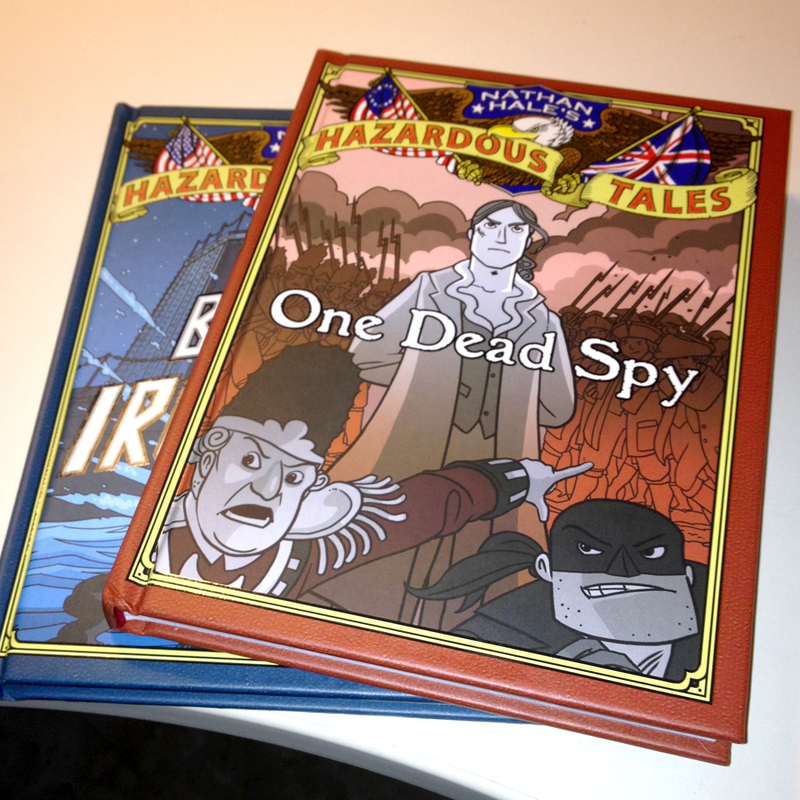 Here's Nathan Hale's Hazardous Tales: ONE DEAD SPY! That's the famous spy (and narrator) himself, Nathan Hale, standing brave before his captors! 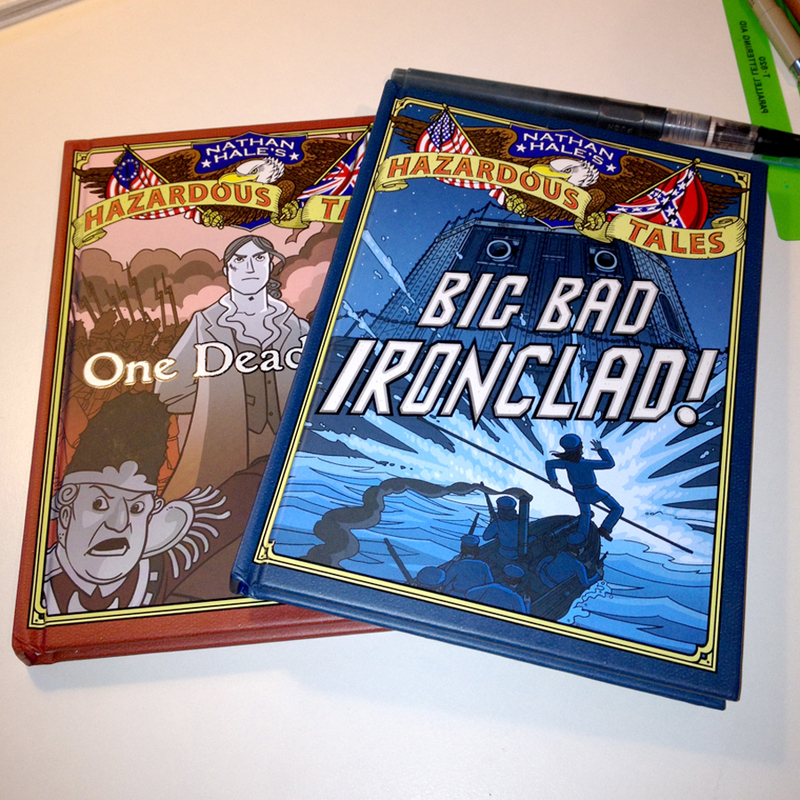 And here is Nathan Hale's Hazardous Tales: BIG BAD IRONCLAD! In a masculine navy blue. Ooh, it looks so sharp. There's Civil War Naval hero Will Cushing on a mission to blow up--well, you'll have to wait and see for yourself. 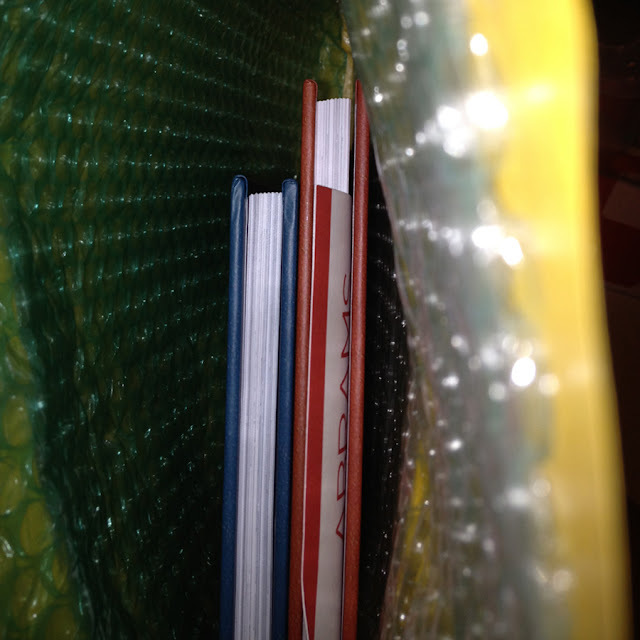 I've had a lot of packages like this over the years; the first look at a final, printed book. Sometimes it's exciting, some times disappointing, sometimes confusing, but this one...this one is the best one EVER. First of all, it's the first time I've gotten TWO books at once, and second of all, the designers at Amulet blasted this one out of the park! These books look so great, you can't quite see it in the photos, but there's a nice glossy sheen to the text and banners, there's a subtle leathery texture print on the borders and spine, they have a nice chunky weight to them, the corners are razor sharp. I'm delighted. I'm very excited to see these come out--and I hope you are too. They come out August 1st! On shelves everywhere! Pre-order here or here! Or better yet, pre-order at your local bookshop! These look so cool! My husband is a huge history buff, and I think he would enjoy these! I shall have to get some copies. Yee Hoo! Summer Reading here we come! I love this. Hey, I know the person who won your art work at the Silent Auction. she was so excited! These look amazing!! i will make sure our system gets them on order! Just finished reading ONE DEAD SPY! You are amazing!! History is not my thing, neither is war, but you made it interesting and, when it wasn't interesting it was funny. Thank you SO MUCH for creating these amazing books. 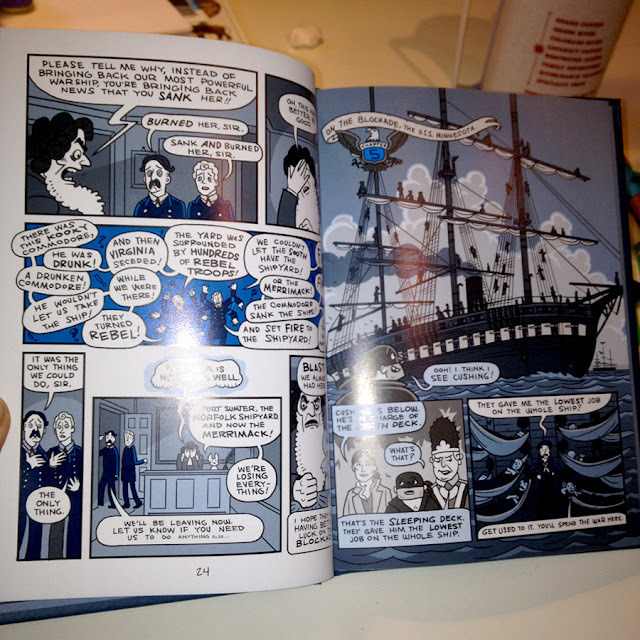 Hopefully all the kids out there who, like me, think history is boring, will gobble the book up like I did. I'll send you a link when I review it on my blog. We want more books! When will the next one be out?